At Leadership Florida, our mission is to continually discover and convene committed individuals, enhancing and recharging their leadership skills by introducing them to a powerful community through whom they find knowledge and inspiration. We engage Floridians by providing essential information and a meaningful forum for their opinions and create opportunities for shared experiences that are inviting, inspiring and of lasting value. One of the many ways the organization is working to accomplish that mission is through its Cornerstone class program. For the last thirty-seven years, between 40 and 70 leaders have been chosen annually to participate in a stimulating and thought-provoking nine-month educational program that consists of five two and three-day sessions held in cities throughout the state. These sessions include programming on issues critical to Florida, leadership skills assessment and training, and relevant information on Florida's history, demography, diversities, and opportunities. One of the most exciting elements of the Cornerstone program is the chance to spend valuable time interacting with other leaders from a variety of professions, philosophies, and parts of the state who represent Florida's diverse ethnic and racial composition. Graduation from the class does not signify the end, but the beginning of a lifetime of opportunity as a member of the Leadership Florida membership network. Leadership Florida convenes regular meetings, regional and statewide, to facilitate continuing issues-oriented education, advanced leadership training, networking and the opportunity for members to work together toward shared goals. 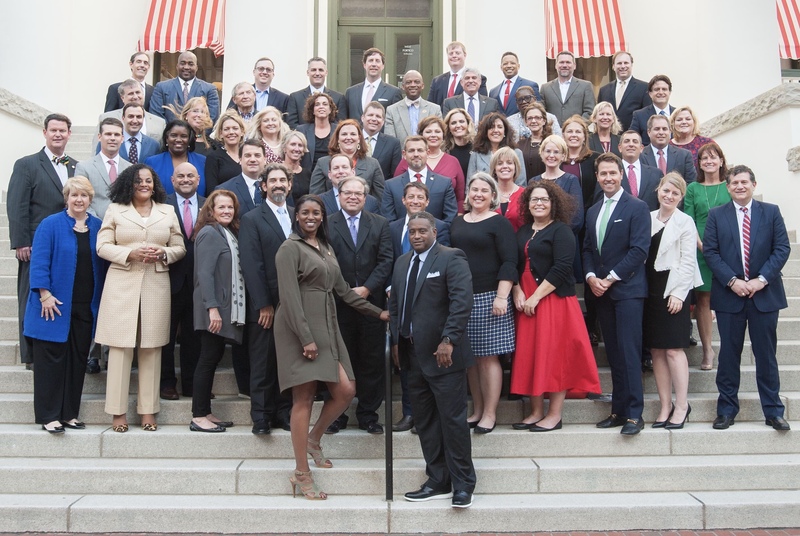 The over 3,100 graduates of Leadership Florida programs are men and women who serve as chief executive officers of some of Florida's top corporations, mayors of major cities, executives of pivotal nonprofit groups, and leading academicians. They are also farmers, managers of high-tech consortiums, rural hospital administrators and head Florida's largest agencies. They own small businesses and are law enforcement officers in cities throughout our state. Their commitment to local and state community is witnessed through their collective service on over 5,000 boards of companies and organizations throughout the state. Please note: You must be 40 years of age or older on September 1, 2019, to be eligible to apply for the Cornerstone Program. Applicants who will be under the age of 40 on the date noted above should complete the application for the Leadership Florida Connect program. Thank You to Our Cornerstone XXXVI Sponsors!